Facing a decline in citrus production in the wake of citrus greening, some of Florida’s growers are turning to protective coverings to block the Asian psyllid that spreads the dreaded Huanglongbing or HLB virus. 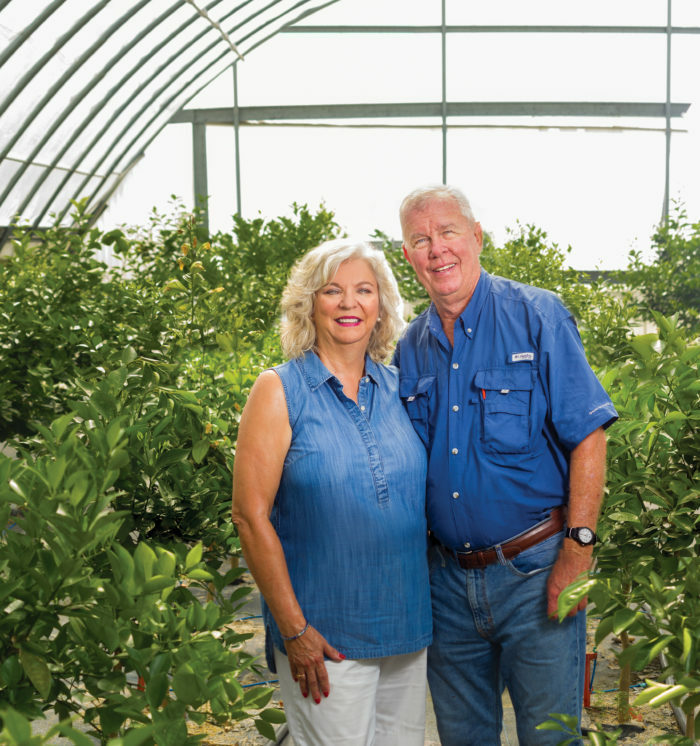 Ten Florida citrus growers have banded together through the Dundee Citrus Growers Association (DCGA) to form what Steve Callaham describes as an agricultural subdivision. It will consist of screened, individually-owned grove lots surrounded by a common area. “It’s sold out,” says Callaham, the association’s executive vice president and chief executive officer. The DCGA, a fresh fruit cooperative dating back to 1924, owns some 150 acres off 80 Foot Road near Bartow and is developing it into the subdivision, with completion anticipated in fall 2018. A variety of citrus trees will be planted in the ground and covered with a plastic woven mesh, which acts as a barrier to insects, but not to sunlight and rain. “All citrus growers are looking for a solution to greening,” he explains. “We do not have any great solutions in my opinion, other than excluding the psyllid.” The protective screen also shields the trees from wind, which should reduce scarring and irrigation costs while improving yields. The Citrus Under Protective Screen project, known as CUPS, has been under study by the University of Florida/Institute of Food and Agricultural Sciences (UF/IFAS), which has estimated startup investments at some $53,760 per acre. At the one-year mark, costs were approximately $29,741; costs stabilize to less than $11,783 in the second year, although a portion is described as variable. CUPS was the subject of a December 2016 field report in Lake Alfred. Others in the industry have been learning more about or are actively pursuing CUPS. Story shares that the family is planning on growing a seedless fresh orange available in the fall market window. “I think it’s necessary to control as much as of the environment as you can for fresh fruit production,” he elaborates. “There will always be a juice product and a juice market for Florida citrus.” Additionally, about a year from now Story plans to plant 20 acres with lemons, as part of the Florida’s Natural incentive program. “The market’s there,” he states. In his license management role, Peter Chaires, executive director of Maitland’s New Varieties Development and Management Corp., has seen the interest in fresh as well. “We have seen quite a bit of renewed interest in fresh selections,” he observes. “There are pretty extensive plantings of lemons, most of which will go into process.” He notes there hasn’t been substantial lemon production in the state since a freeze in 1962. “There’s going to be a learning curve there,” he says. Meanwhile, many growers remain committed to the juice market. “I’m still growing primarily juice oranges,” Weinkauf asserts. “We’re able to provide some of the best juice in the world and there’s something to be said about that,” Spinosa agrees. Polk County had 76,455 acres of citrus in 2016, down from 80,488 acres in citrus in 2015. It ranked first in acreage and third in production statewide in 2015-2016, according to a Florida Department of Agriculture and Consumer Services report. Some 12.5 million boxes were produced. Statewide production has dropped from more than 13 million tons in 1996-97 to some 4 million tons in 2015-16, the report shows. The industry has an economic impact of $8.6 billion and 46,000 jobs, according to Lakeland’s Florida Citrus Mutual. According to the USDA’s June forecast, the state’s orange crop was projected at 68.5 million boxes in 2016-2017, including some 35.5 million boxes of Valencia oranges and 33 million boxes of early, midseason, and Navel oranges. Grapefruit was at 7.8 million boxes, while tangerines and tangelos were at 1.62 million boxes, the report shows. He points out that the rate of replanting has increased. “Record pricing is allowing growers to manage through this difficult period with lower production,” he says. Weinkauf acknowledges things are tough. “Commercial groves right now are challenged from the standpoint of production,” he acknowledges. Yet, he remains optimistic. “We have changed a lot of what we’re doing in the groves and have extended the life and the production of these trees,” he says. The industry is “very close” to a greening breakthrough from science or culturally, he asserts. “We’ve already done a lot better than some of the scientists would have predicted,” he shares.